The SCG FFQ is a research instrument designed to estimate daily intake of a wide range of nutrients in large scale epidemiological studies in adults in the UK. It has been developed in Aberdeen, Dundee and Cambridge from the diet questionnaire used in the Scottish Heart Health Study and MONICA study. 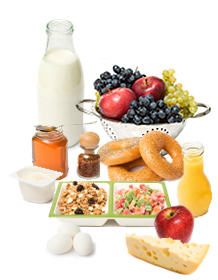 is designed to estimate habitual diet over the previous 2-3 months or other specified period. is completed by the subject either as a paper copy or online. includes up to 175 commonly-eaten types of food or drink grouped into 19 sections. is semi-quantitative, i.e. respondents estimate the amount of each food they have as well as how often they have it. is regularly updated to reflect current eating habits and nutritional composition of foods.